Liv & Let Live : Why yes, I do still exist. Why yes, I do still exist. Welp, it's been forever, I know. Life has just been oober busy, but I beg forgiveness for my tardiness on updating y'all on my Ecua-life. Halloween was a riot! During special ed., we went around "trick or treating" and the kids had their faces painted like Spiderman, a tiger and Batman (SO cute as you can see!). During my Girls English class, we had a little party and then went outside to play at the park. Then, to continue the fun, during Girls Program, we ended up having a giant dance party - I think I had more fun than the girls did...welp! What can ya do?! and Bryan (aka the Ferocious Tiger) celebrating! Stefany, Samantha and me celebrating "El Dia de las Brujas"
Went to Mindo (a cute little city about 2 hours outside of Quito) for a weekend. There was an Ecua soccer game on the night before so we thought it best to go out and celebrate...for 11 hours! Needless to say we were all schmammered and then terribly hungover for our travels, but we persevered and arrived at our destination just in time for lunch [which consisted of white rice and water/sprite]. After lunch, we found our hostel and got ready to zip line! Holy Mother of the Earth!!! So freaking wild. I don't understand why I was the only one FREAKING OUT and SCREAMING MY LUNGS OUT! WOWZERS! It was just beyond crazy - flying over valleys and forest is definitely not something you do everyday. *I apologize to all those zip-lining for my awful profanities...I was just scared sh*tless. A couple weeks later, we had a 3 day weekend, so we decided to venture to the coast [Montañita to be exact - a 10 hour drive....Lord, save us all]. What a FABULOUS TIME! That place is just da bomb - hippie land for sure, but who doesn't love a good hippie or two!? We basically ate, drank and danced throughout the entirety of the weekend. Although the weather wasn't the best, we dealt and it was a riot. I ended up getting 3 dreads. Yes, I said dreads. And they look fluffing amazing if I do say so myself. While in Hippie-land, do as the hippies do. Thirteen out of the fifteen of us went so it was a very cool time to just hang out all together and relax! Two weekends ago, it was Thanksgiving. Now, for those of you who do not know, Thanksgiving is a BIG holiday in my family -- it is otherwise known as Crafting weekend. I LIVE for crafting, eating 24-7, movie marathons and Christmas pukes. 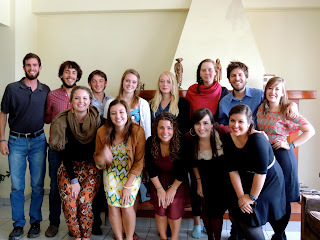 So, as you can imagine, it was quite difficult to be away from my family...knowing that they would all be together was a hard pill to swallow, but I am beyond thankful I have truly incredible friends who have turned into a family down here in Quito to help keep my mind off of being homesick. My mom was kind enough to send down some ornaments to decorate, so on Thursday, while my family was crafting Up North, I was able to craft with my family down in Quito. On Sunday, we had our Thanksgiving feast, and oh man was it a feast! Madre Cindy's turkey cooking skills are wicked. It was really amazing that I was able to celebrate one of my favorite holidays with some truly awe-inspiring people - I am so very thankful and blessed to have this experience as well as these wonderful & supportive people around me everyday. Irene, Lauren, Elizabeth, Becky and myself on our Ecua-Thanksgiving! 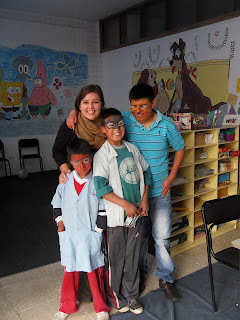 On Wednesday was El Centro del Muchacho Trabajador's 48th Birthday! WOW! What a day, to say the least. Started at 6:30AM when we had to help make breakfast for around 500 people and didn't end until 8PM when the dance was over. During the morning I was helped cook 1500 eggs. Yes, ME cooking. But I must say I did a damn good job - didn't burn one egg! After breaky, the volunteers headed the games/activities. Colleen and I worked the 3-legged race -- what a sight that was! Man alive. The kids were crazy trying to win so they could get a ticket. It was like Gladiator: Ecua-style. Also, there was this thing called a Dunk-Tank. Yeah. All the volunteers had to sit in a chair, while the kids/adults lined up to throw a ball at two cups - when those two cups fell...the MOST FREEZING COLD WATER would drench you. It was hilarious!!! Cold...but hilarious. Then there was mass and lunch, then we all went down to La Marin (the other center) and had dinner/movie & games then a dance. Little did the people know that us volunteers had choreographed a "flash mob" dance. IT. WAS. FLUFFING. EPIC. So very fun, indeed! I am beyond blessed and fortunate to be a part of this amazing organization and I am proud to say that I am a part of the CMT family. So...that's been my life since I've been away from the blogosphere. Hope y'all are doing well. Thinking of you often and missing you more and more each day. "But who doesn't love a good hippie or two!?" Love it! "I miss you, Olivia! She said through a waterfall of tears! P.S. We are back in the U.S. We had fluffing fantastic time in Ireland"